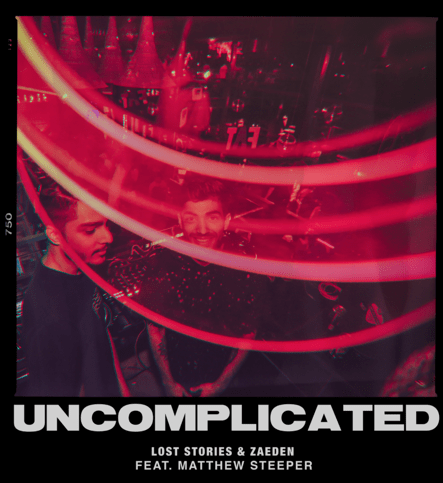 Two of India’s biggest electronic DJ/producers, Lost Stories & Zaeden, have teamed up for the very first time to deliver the stunning new single ‘Uncomplicated’. A slick and melodic production which showcases the signature styles of the trio, ‘Uncomplicated’ utilises luscious chord patterns topped with vocals from Matthew Steeper. The track features a high-tempo build, with Lost Stories already dropping the production to a rapturous reception during a set in front of 15,000 fans in Colombo. A long overdue collaboration between two of the country’s biggest artists, ‘Uncomplicated’ follows Lost Stories’ appearance as the faces of Budweiser’s ‘Free Yourself’ campaign at this year’s Tomorrowland. Garnering widespread acclaim on account of their huge productions and stunning live shows, the duo have performed at several global events, including Tomorrowland, Mysteryland, and IMS Ibiza – where the duo were invited at the special request of IMS founder, Pete Tong. Gaining support from the likes of Marshmello, Diplo, KSHMR, and Dimitri Vegas & Like Mike, Lost Stories – made up of Prayag Mehta and Rishab Joshi – also racked up success with three number #1 iTunes singles via releases with Sony and Universal Music. Going on to remix the likes of Afrojack, Alan Walker, and One Republic, Lost Stories were hailed as “scene starters” by DJ Mag, and surged to the cusp of the magazine’s top 50 during the annual Top 100 vote in 2016/17. With talented DJ/producer Zaeden also providing vocals across his other projects, the producer will launch a debut vocal EP next year. As one of the most streamed electronic artists from India, the youngster has become subject of a somewhat meteoric rise in his career so far, becoming the youngest ever Indian DJ to play Tomorrowland, and the first Indian act to be signed to the iconic Spinnin’ Records label. A powerful and melodic hit which blurs the lines between both up-tempo festival vibes and radio-friendly releases, ‘Uncomplicated’ marks an exciting chapter in the career of both artists, with the collaboration both long awaited, and eagerly anticipated, by fans. Lost Stories & Zaeden collaboration is available to buy/stream here, dropped on Friday 30th November.